There are few artists in the world who ever make it to single name territory: Beethoven, Mozart, Dali, Picasso, Da Vinci. All of them were peerless in their fields and whilst often imitated they were rarely, if ever, surpassed. For history to mark your work so firmly onto people’s minds requires more than just effort, but a preternatural level of skill. Such people define not just generations, but entire eras; carving routes into the bedrock of popular culture. Indisputably one of these colossal figures, Bowie and his music existed in a state of symbiosis. Where his contemporaries took influence from the music they were surrounded by, Bowie found inspiration from the most vividly esoteric sources – krautrock; modern classical music in the vein of Philip Glass; industrial; and world music. All of these and more formed the rich musical tapestry which Bowie dipped into with an almost childlike curiosity and inquisitiveness. It did not always pay off – the albums ‘Earthling’ and ‘Outside’ both feel somewhat overwrought, and his work with Tin Machine marks the sound of an artist reinvigorating himself, as opposed to being reinvigorated – but to grudge someone so prolific the occasional misstep is to fall on the side of safety and complacency. Plus, for every ‘Earthling’, there was a ‘Low’, a ‘Rise and Fall of Ziggy Stardust’, and a ‘Hunky Dory’. For every ‘Heart’s Filthy Lesson’, there was a ‘Lady Grinning Soul’, with its crystalline piano; a ‘Heroes’, with its inimitably anthemic buildup; and a ‘Fashion’, with its edgy dark swagger. I could continue, but the fact is that Bowie was prolifically experimental. Reinventing himself time and time again, and consistently getting it right with little in the way of noticeable effort, isn’t just impressive, it’s genius. Not only that, but the music was never derivative. One of the most frequent “compliments” paid to Bowie is chameleonic. However, to do so misses the point spectacularly. Bowie didn’t change to fit his musical surroundings but rather he crafted an environment in which music moved and wrapped around him like a cloak. 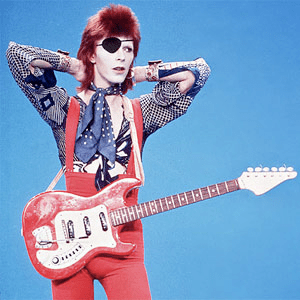 He was inventive, fearless, and pioneering, an icon of the twentieth and twenty-first centuries and Ziggy Stardust’s red and purple lightning bolt motif is now seared into modern culture. The fact that it seems impossible to comprehend a world without his Brixton twinged baritone cutting a new path for the rest of the world to follow is a testament to his impact. Beethoven, Dali, Mozart, Picasso, Da Vinci. Bowie has provided history with a new name to add to that heralded pantheon of artists who have irrevocably forged our view of the world around us. Posted in Music and tagged david bowie, Music, obituary. Bookmark the permalink.